handheld game console, power bank, PS4, Xbox, PS Vita, Nintendo DS, GPS devices, Bluetooth speakers and more. * Premium copper, thick gauge wiring, and durable braided jacket for the cable to ensure safe use by our customers. * We offer more distinctive colorful micro USB cables for you to choose your own exclusive color. It's nice to share with family so that it won't be mixed up again because of the original black or white cable. 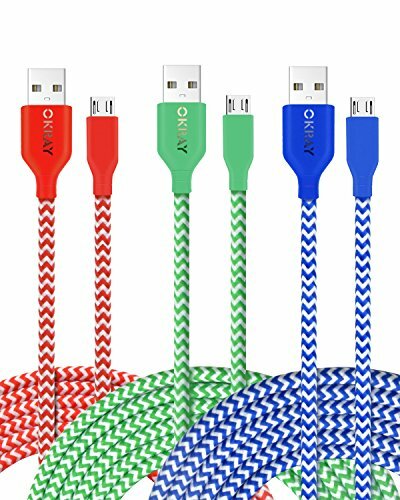 * Length 3 meter tangle-free nylon braided cord is nice when you need extra reach, let you play your phone comfortably and freely in the bed or your car when charging. * Come with 3 Pack to meet your demand in home, company and more places. OKRAY strive to offer the best products and customer service to our customers. All products by OKRAY are exclusively manufactured and tested strictly before delivery. OKRAY 100% stand behind our product. If these products can't meet your expectation, just feel free to contact us via Amazon email. OKRAY Customer Support will help within 24 Hours. ✔ 3M/10FT in length: Compare to original cable which traps you close to the plug when charging, 10ft length extends your connected devices further so that you can enjoy free charging in the sofa, bed, and any other places. 3 pack is ideal for using in home, car, or other place. ✔ Solid construction: The micro USB connector fits quite snug in phone charging port. 6000+ bends tested makes cable built well and sturdier than ordinary cables; and Braided Nylon jacket makes cable tangle free. ✔ USB 2.0 Cable - A Male to Micro B: Thick gauge wiring and reduced cable resistance enable to work perfectly both for charging as well as data transfer. You could enjoy charge times up to 7% faster than most standard alternatives and 480Mbps data transfer via USB 2.0. ✔ Compatible with: Ideal for charging Google Nexus, Samsung Galaxy Tab, Galaxy Note, Note Edge, Galaxy S9 S8, Nokia Lumia, LG, Sony, Blackberry, Motorola, HTC, most Android Tablets and Cell Phones, Windows Phone Smartphone, tablet, MP3 player, camera, hard drive, e-reader, external battery, handheld game console, and more. If you have any questions about this product by OKRAY, contact us by completing and submitting the form below. If you are looking for a specif part number, please include it with your message. [Apple MFi Certified] [3Pack 3.3FT] 2 in 1 Cable iPhone Cable and Android Cable Multiple USB Fast Charge Cable, Lightning & Micro Cable with 8 Pin USB Ports for iPhone iPad Samsung Kindle.